As I follow the commodity markets and report back to you in terms of our current pricing, I think it is important for you to also see where the markets are headed along with what is driving the changes. 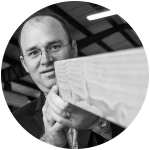 Right now, the biggest two factors in lumber pricing are increasing demand and the unknown regarding the countervailing duty on softwood imports from Canada. Let us address the supply and demand issues first because they are much easier to understand and they indicate some other changes in the market that must be addressed as part of the overall cost of building in the current market. With home building booming in the major metro areas around the United States, mill level order files are pushed out for weeks, and months in some cases, allowing the mills to charge more for the same product. The more common the item, like OSB and CDX, the longer the order files are out giving the mills the power to hold pricing higher for a longer period. With good weather now returning to much of the country, the big users like California are starting to add pressure which will also allow the mills to maintain price and more likely, increase it in the weeks ahead. 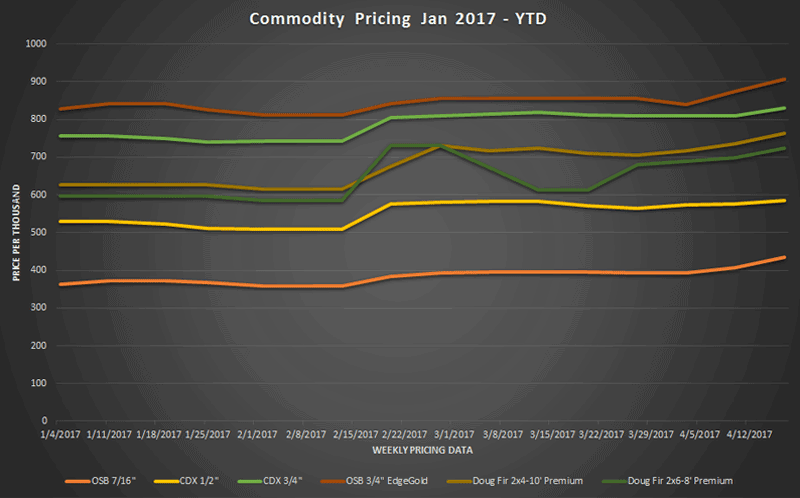 The commodity chart shows how our pricing has changed for 2017. It is important to note that some market dips are indicated, most of those are weather related locally and nationally with the overall trend showing pricing increases in all lines. Beginning this week, we will keep this commodity pricing chart updated on our website along with the commodity price list for quick reference into what is happening in the markets along with showing overall market trends. The next logical question about the supply demand equation is what, if anything, is happening to slow the prices down. Unfortunately, the answer to that question is an expensive one. With the material cost for a house being about 20% of the total cost, labor makes up the next 60% with the balance being given to the state and local economy in taxes and fees related to building process. A recent trade publication for the lumber and building materials industry indicates that it is taking almost twice as long to build a house now because of the labor shortage for sub-contractors in every trade from the pre-recession levels. This labor shortage is leading to large increases in cost for the available labor. The shortage of labor means that demand has not peaked and is likely to remain strong for the foreseeable future. It also means that customers will be trading higher lumber prices for higher labor costs. 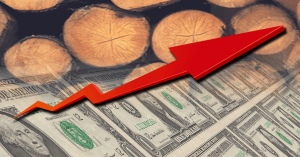 Right now, the market is speculating wildly on what will be passed down as the tariff on softwood lumber in the form of the countervailing duty. The market is also concerned, and rightfully so, about the likelihood of the tariff being applied to orders going back up to ninety days. The fear of the unknown is pushing markets higher to make sure that all bets are covered on a worst-case scenario and for that we are all paying the higher price. What we do not know about the duty is how it will affect commodities at different price levels because the threshold has been poorly defined. Items like cedar and finish lumber that trade at higher per thousand pricing will undoubtedly feel the effects. Items like OSB and 2×4 should not be affected as much because they generally trade below what is believed to be the price threshold. Without knowing where it will land, everything is subject to pricing increase to make sure the mill level profits are protected. These insights are based on information I gather from our supply partners and industry connections on a weekly basis. Please stay tuned to this blog, our website, and our social channels for updated information as it becomes available. If you have any questions about what I see in the market or you would like some additional insights, please contact me at kellyf@lumbertradersinc.com or 360.452.8933.